Appearance: Human-halfling hybrid on the taller side of halfling and shorter side of human. White hair pulled back into a plait. A complicated harness of straps and metal which makes it look like she's wearing a metal corset outside her clothes. Expensive outer robe and a fine cane. History: Marta Agosti has been married to a sailor, a merchant, and a council elder in that order, and with some overlap between. 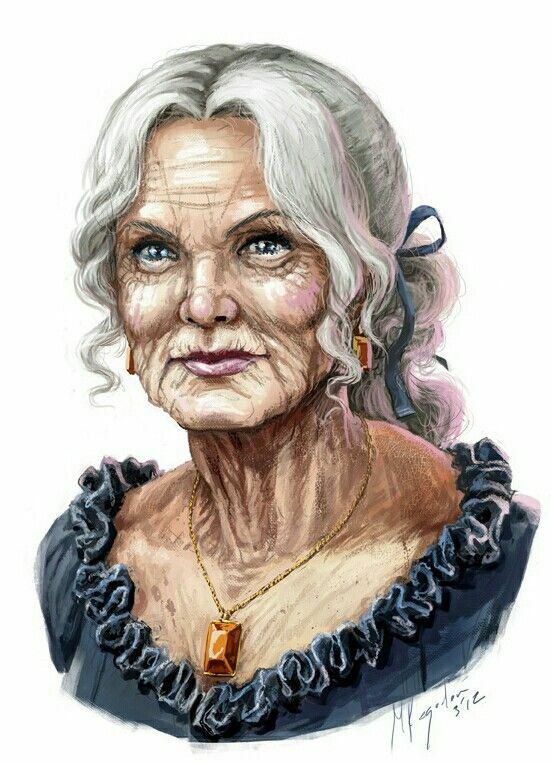 Though she is elderly, wrinkled, and hunched, it is possible to see in her piercing eyes and fierce smile the formidable beauty she was in her prime. Marta has surely been told 'no' before in her life, but it is impossible to believe she allowed such a tiny little word to deter her. If personalities were weather, hers would be a hurricane. Her spine, twisted almost from birth, has only curved more with each passing year. She walks with the aid of an expensive cane that declares her wealth, and wears over her clothes and under her cloak a custom back brace made for her by Ellowyn. The brace has metal for support and leather straps for breathing room; the straps must be replaced regularly as the leather loses its spring over time. When Ellowyn died, Marta swept into the city morgue and claimed the body through sheer force of will and the greasing of a few hands with coin. She directed the body be taken to the Temple of Yondalla and paid for Ellowyn's resurrection herself. This expensive gift of life is not without strings; Marta is determined that Ellowyn pay her back in free maintenance of her brace and cane. Visits to Marta to maintain her equipment often result in new jobs. Marta has a way of talking up the little gnome to her elderly friends and relations in need of assistive devices, and sending Ellowyn off to meet with them after she's laid the foundations. These jobs are not free, and in this respect Ellowyn's relationship with Marta is highly lucrative. Other Details: Marta is a faithful worshiper of Yondalla, but has a soft spot for Lastai and Lirr. She will not even set foot in the temples of the male gods, however. Though Ellowyn is not aware of this, Marta has written the little gnome cleric into her will. Uncommonly Known: Some years ago, Marta sought Yondalla's aid in conceiving a child. She met with Father Rik Templeborn and completed the ritual with him, but did not conceive. Though she has her own beliefs as to why the ritual didn't take at her advanced age, she holds no bitterness and believes she simply was not meant to be a mother. She makes a point to say hello to Father Rik whenever she visits the temple. +1 to Roo's "ahhhhhh my poor heart"
I know right!?? That whole thread has had me gripped af.